We all know that most developers and administrators uses SSH client to access their managed remoted servers. One of the third party tools that came first into our mind is Putty especially if you are a Microsoft Windows user. With the new features added to Windows 10 updates, you can now easily use SSH client and Server without using third party software. It is now built-in in Windows 10 and available as an optional feature that you can easily enable or install in just a few clicks. Though it’s on a beta phase, it works perfectly fine when accessing your remote machines. Once you successfully install the SSH client as additional feature, you can now use the Windows 10 command prompt to access your servers. It works on both 32-bit and 64-bit Windows operating system and of course, you need an internet connection to complete the installation process. Click on Windows Start or Home Menu. Go to Settings then click Apps. On Apps and features, click on Manage optional features. Click on Add a feature then scroll down and look for OpenSSH Client. 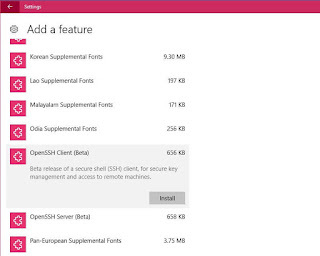 Select Open SSH Client (Beta) then click install. Wait for the installation to finish downloading and you are done. If you encounter problems on installing this feature like error code 0x800F0908, just turn off your metered internet connection. If typing ssh is not recognized as an internal or external command, you can run command prompt as administrator or reboot your computer to solve those kind of issues.